The ACOS Lite files contain bias-corrected XCO2 along with other select fields aggregated as daily files. Orbital granules of the ACOS Level 2 standard product (ACOS_L2S) are used as input. The "ACOS" data set contains Carbon Dioxide (CO2) column averaged dry air mole fraction for all soundings for which retrieval was attempted. These are the highest-level products made available by the OCO Project, using TANSO-FTS spectral radiances. The GOSAT team at JAXA produces GOSAT TANSO-FTS Level 1B (L1B) data products for internal use and for distribution to collaborative partners, such as ESA and NASA. These calibrated products are augmented by the OCO Project with additional geolocation information and further corrections. Thus produced Level 1B products (with calibrated radiances and geolocation) are the input to the "ACOS" Level 2 production process. Biases in ACOS data are still studied. The project recommends using the Lite products. 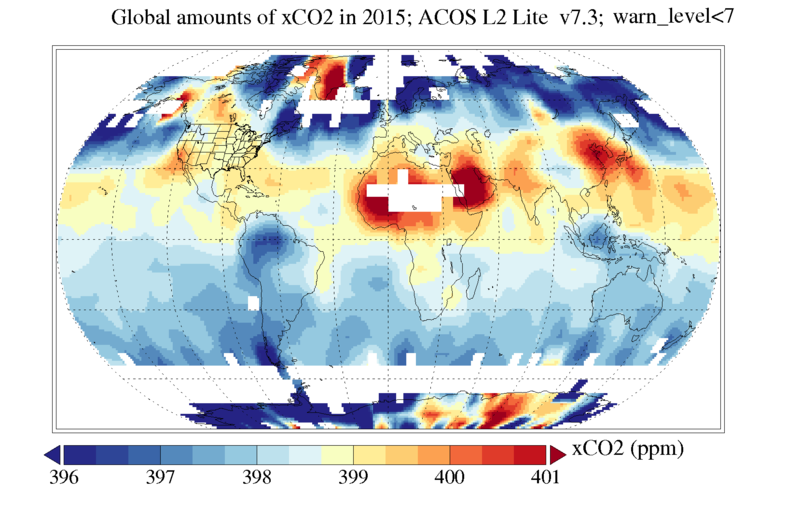 Global amounts of column CO2, averaged for 2015, using ACOS_L2_Lite_FP v7.3. This average used 365 "Lite" files, gridded on a 6x6 deg grid, and smoothed for the presentation.